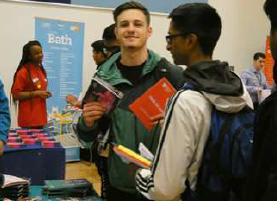 On Monday 4th March our school opened its doors to Year 12 students from across the borough and welcomed them to our University Fair. 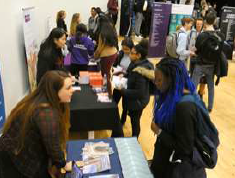 Thirty four universities travelled here to talk to students and give advice and guidance on the next stage in their education and future career. Students from 19 different schools attended with over 600 students passing through the fair. 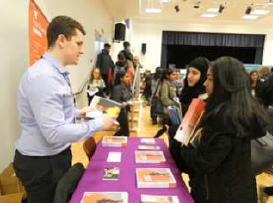 Students had the opportunity of attending talks on: Student Finance, STEM Careers, Applications to Medicine and Dentistry, Oxbridge Applications, Degree Apprenticeships, Competitive Applications as well as talking to experts on applying to universities in the USA. Mr Gareth Thomas, MP, supported the school in organising and promoting the event and also attended the Fair and we are very grateful for his participation. 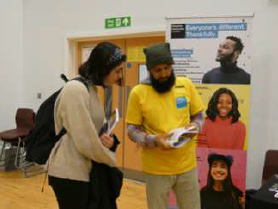 ‘Students were able to ask pertinent and intelligent questions about studying at University and comparisons between courses’. ‘I found the University Fair very interesting as I was able to meet with current students and even some professors directly. I had engaging conversations about life at university and specific details about courses. Importantly I attended a talk on ‘Competitive Applications - Russell Group Universities’. 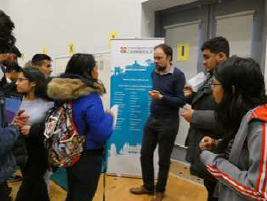 The speaker from Leeds University spoke about student finance and made everything so much clearer and the Kings College representative explained the process involved in applying for medicine. These were my two biggest concerns and now I have answers to my questions and feel more confident. Although it was slightly overwhelming at first, as there were so many universities to go to, there were also specific talks that were really informative. Overall it was amazing to be able to have my questions answered and my fears about life at University allayed. 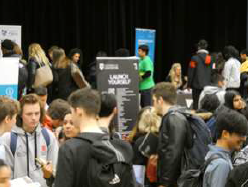 In addition to the Year 12 students Year 11 students were also invited along to the University Fair as well.